There is a growing need for online learning in the changing times of technology. Asynchronous learning, where the ‘trainer’ is now a module that the learner digests independently, can feel a bit robotic at times – it misses the human factor. 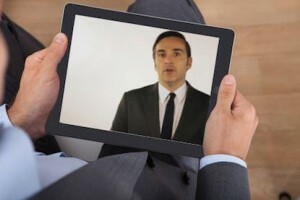 So, how we can bring that human factor back into elearning? Unlike elearning, most knowledge-driven courses are in a classroom with a live instructor and other students. In this setting, you are able to see the expressions of others in the room to continue a conversation or study their reaction to certain topics. 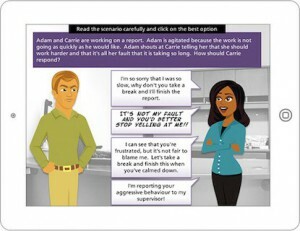 How helpful will it be to add scenarios in our elearning and make them is as realistic as possible? The use of scenarios is the introduction to storytelling. The help of two characters engaging in a conversation can develop learner engagement. Characters and stories should be relatable, so the learner can grasp on easily to the subject matter. This helps if the actual scenario and character can mimic real world experiences, perhaps include dialogue and images encountered in the learner’s everyday life. Diversity can play a huge role as well. The characters chosen for the scenarios should be personal. We can consider their names, facial features, situations and/or any type of obstacles they may be facing. The key is to make the scenario as realistic as possible, so the learner can relate and find practical application. An effective tool for expressing dialogue between two characters are speech bubbles. In the past, we have seen speech bubbles in comic books representing conversation. In elearning, the use of speech bubbles can be used for vector characters or human photos. Through audio, speech bubbles, and color distinction, the learner can visualize their role in a setting and be more engaged. An avatar can also guide the user through the course which helps with the flow and keeping it personalized as the course moves forward. When transitioning from in-class learning to On-demand learning, a video of the actual trainer opens the door for the learner to interact with the trainer. Ultimately, this transition becomes much smoother for the learner. The trainer can introduce the course along with the objectives and also include narration in their own voice. This is optional, as the audio can also be recorded by a professional narrator in a studio. Here are some tips that may help the instructor to create a more dynamic environment and show the effectiveness of learning and teaching through video. In conclusion, you can bring the human factor back into your elearning by adding scenario’s, role play, and video of the trainer.